When it comes to small size, but big output, the P-K THERMIFIC® boiler is hard to beat — even the largest model can be moved through a 30” doorway! Its state-of-the-art vertical design, utilizing a radial-fired, fan-assisted burner and heat exchanger, is the key to efficient performance. This design enables it to operate at a CSA certified thermal efficiency of 85% as a Category I non-positive, non-condensing appliance. All P-K MODU-FIRE Forced Draft boilers now come standard with Harsco Industrial Patterson-Kelley’s ENVI® control system. Advanced features such as cascade sequencing and building management system integration via MODBUS® protocol makes it easy to set up and manage P-K MODU-FIRE Forced Draft boilers, even when used in a hybrid system design with P-K MACH® condensing boilers. The P-K MACH condensing boiler is an ideal choice for a wide variety of commercial and industrial building applications, including new construction as well as retrofit projects. Once again, Harsco Industrial Patterson-Kelley leads the industry into a whole new dimension with a boiler of vastly greater capability and performance precisely tailored to today’s conditions and requirements: the P-K MACH boiler. 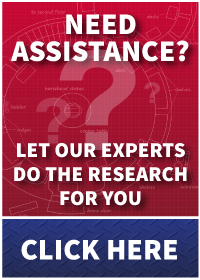 Research shows the P-K MACH boiler features the best, most advanced metallurgy ever offered in a commercial heating boiler. 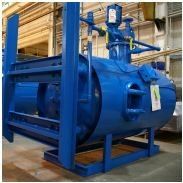 The P-K MACH boiler works as well in older systems as in modern ones and in a wide range of temperatures to achieve unprecedented cost savings and efficiencies. After installing the P-K MACH boiler, countless users have been able to reduce their fuel bills and total cost of ownership. 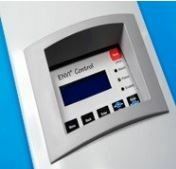 All P-K MACH boilers, including dual fuel boilers and outdoor boilers, come standard with our easy to operate ENVI® control system. The ENVI control even allows a P-K MACH boiler to be paired with a P-K MODU-FIRE® Forced Draft boiler to create a cost-effective hybrid boiler system. Many customers have relied on Harsco Industrial Patterson-Kelley’s MACH® condensing boilers for when they need a condensing boiler that is reliable, efficient and constructed of quality materials. The P-K MACH condensing boiler is an ideal choice for a wide variety of commercial and industrial building applications, including new construction as well as retrofit projects. 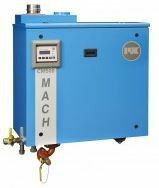 We have recently taken a step to improve on the success of the P-K MACH boiler with the introduction of P-K MACH Dual Fuel boilers. The P-K MACH dual fuel boiler can easily be switched from natural gas to liquid propane, allowing the boiler to run even in emergency situations, which is often a crucial requirement for hospitals and schools. Discounts for interruptible gas service may also be available in your area, allowing you to save extra money. P-K MACH® outdoor boilers feature the same quality and reliability that you have come to expect from P-K products. A unique aluminum alloy heat exchanger is at the core of all of our P-K MACH boilers. This heat exchanger was designed to resist corrosive condensate while providing some of the highest efficiencies that a condensing boiler can achieve. P-K MACH boilers are CSA-certified from 92% to 96% and may provide actual net thermal efficiencies up to 99%. The P-K SONIC breaks through the limitations of all other stainless designs with our revolutionary new DUET™technology, an industry-first heat exchanger comprised of two unique chambers designed to optimize the turndown process. This unique design allows the P-K SONIC to operate at 96% efficiency with a 5:1 turndown and ultra-low emissions. Harsco Industrial Patterson-Kelley does it again! We have managed to make the smallest condensing boiler even smaller. Our new and improved P-K MACH CM Series boilers require 40% less space than their predecessor. P-K MACH CM Series boilers are CSA-certified at >90% efficiency to lower operating costs and low NOx to promote sustainability. They are the ideal condensing boilers for a multitude of commercial, industrial, and institutional applications. Versatile piping connections, zero clearance and a wall hanging option make these boilers the perfect solution for any retrofit project. Do you have a small mechanical room, height restrictions or difficult entry? P-K MACH CM Series boilers fit into the tightest of spaces. Equipped with the latest touch-screen technology, the NURO Touch-Screen Control System provides the most intuitive interface in the industry. Designed to maximize efficiency, the NURO Control System monitors and modulates the combustion and ignition of the boiler to maintain the desired outlet temperature. The NURO Control System utilizes the most stable technology in a totally easy-to-use package, ensuring safe, efficient, reliable boiler performance year-after-year. Designed to maximize efficiency, the P-K ENVI® control system monitors and modulates the combustion and ignition of the boiler to maintain the desired outlet temperature. This flexible boiler control system can run a single boiler or a master/member network of up to 16 boilers. The lead/lag setup and boiler start rotation ensures run times are equally distributed across each unit in the system, extending the life of the boilers. P-K COMPACT® semi-instantaneous water heaters perform reliably, providing long, trouble-free operation in thousands of installations. Its design, which focuses on small heaters that produce high volume output at a closely controlled temperature, makes it an ideal water heater for almost any building owner. Simply put, scale is a domestic hot water heating system’s worst enemy. Build up of scale can reduce the efficiency of a heating system. If allowed to accumulate over time, the scale build up could ultimately result in premature system failure. For these reasons, preventing scale is critical to maintaining optimal system efficiency and ensuring energy savings. Designed to be paired with a P-K MACH® boiler for domestic hot water production, P-K DURATION™ condensing water heating systems are specifically designed to help prevent scale build-up. By protecting your high efficiency water heating system against scale, you can cash in on energy savings. The P-K Mach ‘n Roll™ system provides building heat and domestic hot water with little to no scale build up. 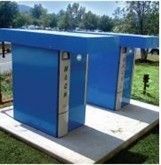 It is ideally suited for commercial building applications such as schools, office buildings, apartments, hotels and offices. This efficient water to water heating system is manufactured from the highest quality materials combining a robust aluminum alloy heat exchanger above, with an indirect stainless steel heat exchanger below. Both zones were individually engineered using different alloys that when used together, delivers higher efficiency and industry leading reliability. Best of all, the P-K Mach ‘n Roll system was designed with service in mind. The indirect heat exchanger section is mounted on a pull out tray, making it fully accessible from the front of the boiler. Inspect, clean or repair the water side without having to “tear the boiler apart”. For full access, isolate the boiler and domestic lines, remove couplings and unions, take off the front access panel and slide out the heat exchanger. Storage water heaters provide excess capacity to satisfy peak demand without peak energy requirements. The P-K CONTROL-FLO™ storage water heater offers instant response to hot water demand, elimination of peak energy loads, availability of all stored hot water, high capacity and simple installation. Compared with conventional storage water heaters, the P-K CONTROL-FLO water heater engineered packages offer 25-30% less storage capacity to handle the same peaks. This decreases the size of the unit needed to carry a given load. Our proprietary ANTICIPATOR® control system activates the control valve to admit the heating medium before any temperature change is sensed in the storage tank, providing a closer control of water temperature. 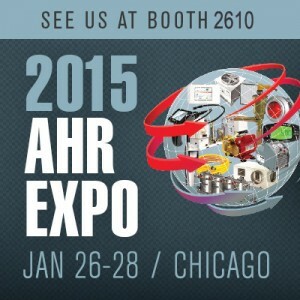 This design supplies peak hot water demands without peak energy requirements.